Now that we have shown that the hypothesis “more guns = more ‘gun deaths'” cannot be true in America, what about on an international scale? Well, this is where things get really complicated. Not all countries keep good records of their respective murders, much less their respective firearm ownership, so we are going to have to do a massive amount of estimating. For the number of firearms in civilian ownership, we will refer to the 2007 Small Arms Survey, Chapter 2, Annexe 3 (*.pdf warning) and their documentation of 178 different countries. We will consider the numbers from every possible country in North, South, and Central America; North, South, Eastern, and Western Europe; Oceania; and a few other odds and ends to round out the data set to a good sample body of 100. I used the average of the “Low Total from Outside Sources” and “High Total from Outside Sources” where available, and “Registered” if not, to generate the ownership numbers for the individual countries. It is worth noting that some useful countries – like Denmark, India, and Luxembourg – are omitted from the survey; for these countries, the only numbers available are “Total from Regional Correlation” – i.e. they were making a guess based on the guesses they made around that country. Likewise, the population numbers for the countries considered came from the same Small Arms Survey. I hate to admit this, simply because I hate using Wikipedia as a primary source for anything, but the numbers of murders per country, from which I calculated their murder rates, is from the List of countries by intentional homicide rates. As always, these numbers are subject to the inherent flaws in various countries’ recording methods, as well as the flaws intrinsic to Wikipedia itself. It is worth noting that we are considering total murders this time around, rather than simply “gun deaths”. If you think recording methods are inconsistent among various nations, just imagine how messy trying to track means of death would be. You almost certainly will want to click on it to make it larger. 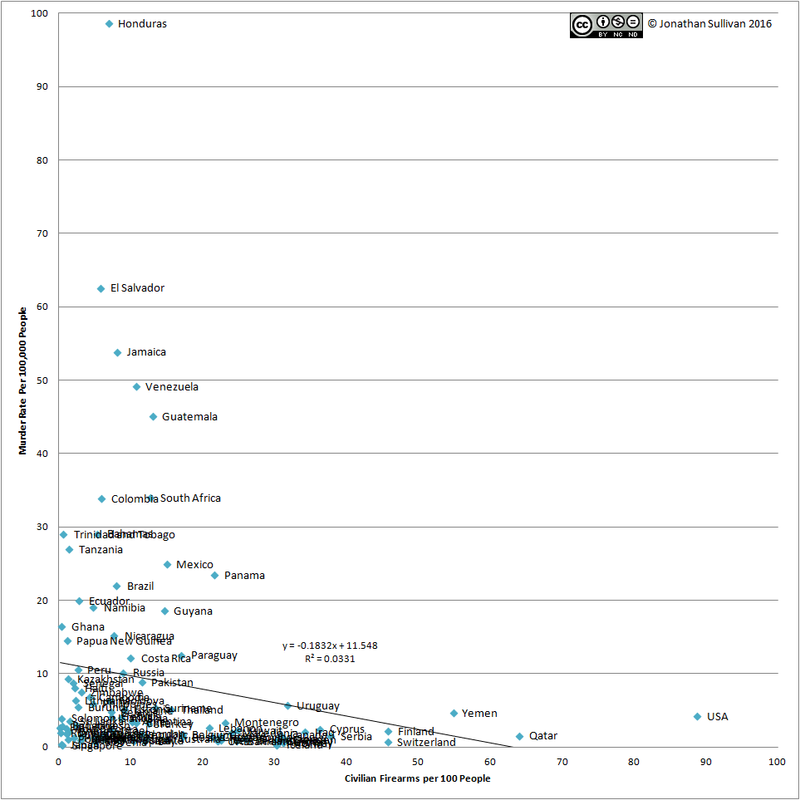 The line slanting down from left to right is the trendline of the datapoints; basically it shows that the correlation between firearm ownership rates and murder rates in the 100 countries sampled is negative, at a coefficient of -0.1832. Note that this is a weak correlation, and thus cannot be considered binding. If you want to see what the other 100 countries were, since a goodly number are stacked on top of each other, the source data is available for your consideration. Next Next post: what is “high-powered”?